And it looks like I hit the jackpot! Not only did this month’s Love with Food box include TEN appetizing goodies, but, also a tote/grocery bag with a Love with Food Logo on it. Yay! And all of this fit into the one box. Amazing. Then I saw this cute marshmallow called a MaddyMelt from Madyson’s Marshmallows. It is round and flat, and created to fit atop a mug of hot chocolate perfectly. I can’t wait to try this with the All Natural Drinking Chcoolate from Les Confitures a l’Ancienne, also in this month’s box. The snow Angell bar is tasty, but, I found it a bit too sweet for my liking. I think if I were selecting the items for this box, I would have gone with the “Dark Angell” candy bar. But I get why the Snow Angell was chosen, since this is the Christmas box. I do like that there are oats in this candy bar – a little bit different, and it makes the filling in this bar a little less sweet than “nougat” in commercially manufactured candy bars. There’s also an Excellence 70% chocolate diamond from Lindt, and a chocolate dipped Madeleine cookie from Donsaemor. Another cookie in this month’s box seemed perfect for the season: Molasses Spice Cookies from Grep Ghost Bakery. Another perfect season choice is a package of Peppermints from St. Claire’s Organics. The peppermints are nice and minty. Sweet but not too sweet. I found them to be a soothing remedy for after something spicy, not just did it calm my breath but also my tummy. And rounding out the box with some savory selections are the Natural Crispbread Crackers from 34 Degrees and a package of Spinach Dip Mix from Dessert Gardens. See what I mean? Wowza! What a box! These could be our favorite new product of the year. These delicate morsels are crafted with pure Maker’s Mark Bourbon and exhibit notes of wood, vanilla and oak. Each box contains 16 marshmallows, a perfect amount for eating. I received a box of these amazing marshmallows in my November Knoshbox! For quite a while now, I have sung the praises of a certain marshmallow making company, so please don’t take this review as my way of changing “favorites.” I still love that company, but I think there’s room enough at the top for two marshmallow favorites. These marshmallows are amazing. As in … they are SO GOOD. They are fluffy and chewy and sweet. And I can definitely taste the bourbon in them. I could even smell the bourbon when I opened the package. I’ve never been big on alcoholic beverages (as I’ve said before, I’m more like a TeaTotaler! ha!) but I like the contrast of the flavor of bourbon with the marshmallow sweetness. It’s like a sweet confection that’s just for adults. I love these marshmallows. I’m so happy that Knoshbox put them in the November box! These taste amazing as a topper for hot chocolate or for sweet potatoes, and they’re delightful eaten on their own. If you have a soft spot for homemade marshmallows, you’ve got to try these. sweet, crispy and a lot of delicious. 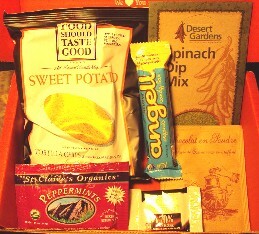 I received a .8 ounce bag of Sweet Potato Pop Chips in my November Love with Food box. When I munch on salty snacks like these, I like to drink iced tea because they just seem to go well together. I brewed up a pitcher of this OYGFIB? blend from 52Teas last night, and I enjoyed a tall glass of it with these Sweet Potato Pop Chips. A really tasty snack. 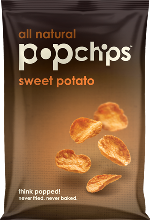 When I first saw “Pop Chips” on the grocery store shelves, I didn’t really think much about them. Something about them sounded “off” to me … was it like a thin rice cake that is made to taste like potato chips or what? But it turns out, they’re nothing like what I thought they’d be. These are actual sweet potatoes (and rice flour) that are air popped to create a crispy, tasty snack that is (in my opinion) just as tasty as a fried potato chip, but without the fried thing going on, because, you know, fried is not only not the healthy way to go, but, it also is greasy and after a couple of potato chips, I tend to find this greasiness rather unpleasant. These aren’t greasy at all. I taste the sweet potato, and it tastes the way I expect a sweet potato to taste: Sweet and savory and delicious. I think that this has been “seasoned” with a touch of sugar and I can taste a hint of salt too. That’s it. I taste a lot of sweet potato flavor, and a little bit of sugar and a little bit of salt. And a whole lot of YUM! These are the new must have as far as I’m concerned. I’ll be buying more of these. Fortunately, they have acquired a certain amount of popularity, as I have seen these in my local Whole Foods. I’ll start checking the other grocery stores as well. I can’t wait to try some other flavors, when I do, I’ll be sure to update my blog with those taste discoveries. Photo from Love with Food. If you haven’t tried Kukuruza yet, we shall be the first to say that your mouth is missing out. You’re curious, we can see it now. This unique combination of premium milk and white chocolate will help satisfy your savory and sweet cravings, all in one bite. 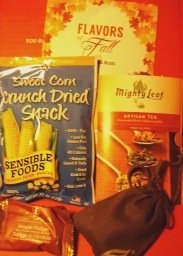 I received a pouch of Kukaruza Tuxedo Popcorn in my November Love with Food Box! I brewed up a cup of this Dian Hong Congfu Black Tea from Joseph Wesley to enjoy with this yummy confection. The malty notes brought out some of the caramel-y notes that were a little obscured by the chocolate coating and i liked the way the tea complemented the delicious popcorn. Delicious! Kukuruza starts with their classic caramel coated popcorn, and then they drizzle milk chocolate over the popcorn, and then they drizzle white chocolate with a hint of vanilla over that! Mmm! The result is a decadent, delicious confection. These morsels are very chocolate-y, and the milk chocolate is what I taste first and foremost. Then I notice the sweet, creamy vanilla tones. I can taste the buttery caramel and hints of saltiness. It’s a dreamy concoction that is both sweet and savory, but, mostly sweet. In fact, if there was more in this “flight” bag than just 1.5 ounces of the popcorn, it might end up becoming too cloying. However, with the small portion, it was just enough to satisfy a sweet craving without getting too sweet. I love this stuff! I will definitely keep my eye out for this product while I’m out shopping. If I don’t find it, I’ll have to buy some online, because I can see myself craving this. So yum! Color versus Colour? Yogurt or is it yoghurt? Well no matter how you spell it, this all natural bar takes the cake. It is a simple mix of unsulphured apricots, crunchy almonds and coconut and then topped with a smooth layer of yogurt coating. I received one of these bars in my November Love with Food Box. I brewed myself a cup of chai and turned it into a latte with Chico Chai’s Original Loose Leaf Chai. Then I decided that this bar would make a lovely accompaniment with my chai. The sweetness of the bar enhances the spicy notes of the chai – these two work really splendidly together! The first thing I notice when I’m reading up on this bar is that there aren’t a lot of extraneous ingredients to it. The yogurt coating has a few ingredients to it, and then there is just crisped rice, apricots, almonds, coconuts, honey and glucose syrup. It is a little on the sweet side. I am thinking that this could be tasty without the yogurt coating. I mean, I like the yogurt just fine, and I have a sweet tooth so I’m not complaining about the sweetness of it … but I’m just saying that I don’t think it needs the yogurt coating. It would be a tasty fruit and nut type bar without the coating. There are lots of crunchy almonds and sweet apricots in this. I can feel the texture of the chewy coconut. I don’t taste too much honey or syrup in this, I like that these two sweeteners don’t overpower the bar and take away from the natural taste of the fruit and nut flavors. I liked this. This is something that if I were wanting a quick and easy snack, I’d grab one of these bars. This is something that I wouldn’t mind having on hand for when I want something a little sweet. I like the variety of textures within the bar – the chewy of the apricots and coconut, the crunchy of the almonds and the crispness of the rice. Overall, a really tasty snack. 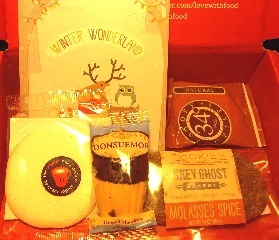 My November Love with Food Box has arrived! Yay! It’s always a happy time when I receive a treasure in mailbox, and this month’s Love with Food box certainly qualifies as a treasure! This is a seriously awesome box! This month’s box had NINE treats in it, plus a bunch of coupons, including a coupon for a gift subscription to Love with Food. I’m thinking I might treat my oldest daughter to a subscription. In addition, I also received a $1. off coupon toward a Green & Black Organic Chocolate bar (yum, chocolate!) and there’s even a recipe card from Chef Ryan Scott (who curated this box). The recipe is for green olive tapenade, which I will definitely try. Anyway … on to the yummy goodies in this month’s box. There’s a bag of Tuxedo Popcorn from Kukuruza, a bag of Sweet Potato Popchips, a sample of Rosemary and Pink Sea Salt Shortbread Cookies from Dancing Deer Baking Co., an Almond Apricot and Yoghurt bar from Eat Natural, a bag of Sweet Corn Crunch Snack from Sensible Foods, Ginger Twist Tea from Mighty Leaf (Yes TEA! ), Maple Fudge from Laura Secord, a small organic dark chocolate bar from Green & Black, and Indian Spices from Arora Creations. Wow! 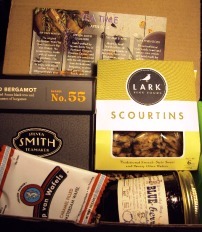 This may be the most plentiful box that I’ve received from Love with Food yet! And what’s more, I haven’t tried any of these things … including the tea! I’m excited to start digging in!